Do not overload your tires. Driving on any overloaded tire is dangerous. The maximum load rating of your tires is marked on the tire sidewall. Do not exceed these ratings. Tires which are loaded beyond their maximum allowable loads for the particular application will build up excessive heat that may result in sudden tire destruction. Integral damage may be caused to the tire which cannot be seen (even if removed from the wheel and inspected). Do not exceed the gross axle weight ratings for any axle on your vehicle. Consult the vehicle placard and/or vehicle owner’s manual to determine the gross axle weight rating. Following the loading instructions of the vehicle manufacturer should ensure that your tires are not overloaded. Load Index. The Load Index is a numerical code associated with the maximum load a tire can carry at the speed indicated by its Speed Symbol under service conditions specified by the tire manufacturer. Speed Symbol. The Speed Symbol indicates the speed at which the tire can carry a load corresponding to its Load Index (except for speeds above 210 km/h, see table of load capacity versus speed below) under service conditions specified by the tire manufacturer. Speed Category. The Speed Category markings shown below indicate tire speed capabilities above 240 km/h and are included within the tire size designation e.g. 225/50 ZR 16. Generally, Service Description is not shown on such tires. For actual speed capabilities and load capacities, consult the tire manufacturer concerned. Tires for speeds over 240 km/h may be marked for an interim period with both ‘ZR’ and the relevant service description (e.g. 195/50 ZR 15 82W, 195/50 ZR 15 82Y) to specify the tire performances; in the absence of service description, consult the tire manufacturer for actual maximum speed and the relevant load capacity. All speeds shown in the tables apply to tires when in good condition, inflated to the correct pressure, operating within their specific load capacity and fitted to a correct size rim. Percentage of Load Capacity (%) versus Speed1. 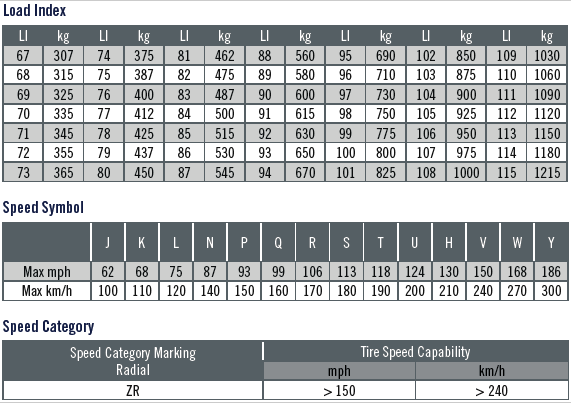 For ZR Tires, where no Service Description is shown, the Maximum Load capacity shown in the Tables applies; the actual speed capabilities, load capacities and the relevant inflation pressures will be agreed between vehicle and tire manufacturers (or their national associations) taking into consideration the vehicle characteristics and the type of service. In the absence of such an agreement, it is recommended that for speed capabilities between 240 and 270 km/h, the load capacities and relevant inflation pressures of ZR tires be the same as for tires with ‘W’ speed symbol, up to the maximum speed certified by the tire manufacturer. 1 For intermediate maximum speeds, linear interpolation of the tire load capacity is permitted. 2 For speed capabilities over 300 km/h, the percentage of the load capacities and the relevant inflation pressures will be agreed between vehicle and tire manufacturers (or their national associations) taking into consideration the vehicle characteristics and the type of service. Towing a trailer: Check the vehicle owner’s manual supplied by the manufacturer of your vehicle for further recommendations on trailer towing.